Despite the wintery cold weather and my natural need and craving for warming and comforting dishes, I have been trying to increase my intake of raw food lately. This doesn’t come naturally to me as I don’t deal very well with the cold. Nevertheless, I always try to include a smoothie or two in my day but more than that is a struggle in winter. Not sure I picked the best time to do start my new regime though as it’s getting colder and it’s even snowing today!! After weeks of teasing, the kids finally woke up to see the garden covered in the white stuff. Exciting morning in this household, let me tell you! So true to my new resolutions, I have now resume my summer routine of smoothies or raw overnight oats to start the day with a cup of green tea to keep me warm and happy. That’s the easy bit though. Lunchtime is more tricky as all I want is a big bowl of soup or something of the kind, but I am now making a conscious effort to include more salads and raw greens. I still want a delicious, nutritious and filling meal though. This salad is a kind of compromise as not 100% raw but still contains a good amount of mixed salad leaves, pomegranate , raw seeds and nuts and a good dose of ginger to help find colds. The dressing is really good and I have been drizzling it over everything from salads, slaw, cold noodles and stir fry. You can easily add more raw veggies, I have also made this salad with the addition of cucumber and avocado. If you don’t have quinoa, you can easily replace it with couscous or millet and for toppings, feel free to throw in whatever take your fancy. I like to re-heat the chickpeas and quinoa but you can omit that step and enjoy it cold. 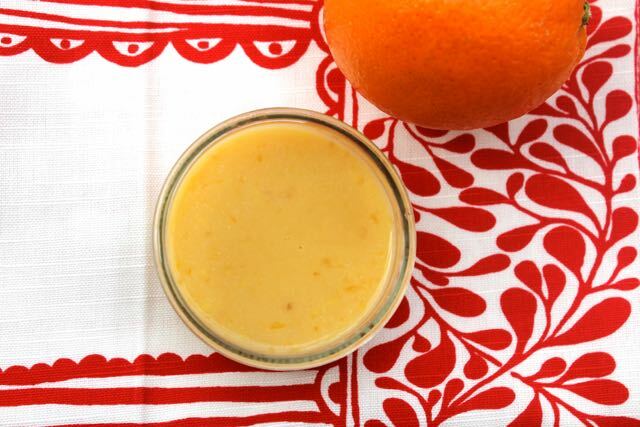 In a small bowl, combine the orange juice, miso paste, mirin (if using), agave and ginger. Add a bit more water if the consistency is too thick. Leave aside to mingle while you assemble the salad. Reheat the chickpeas and cooked quinoa in a pan, on a low heat. Wash the salad leaves of your choice and arrange in a plate. Drizzle with a bit of dressing. Add the quinoa and chickpeas, pomegranate seeds. Gently heat the almond flakes in a pan, on a very low heat. Watch them carefully so they don't burn. When ready add the almonds to the salad. Drizzle a generous amount of the dressing all over the salad and enjoy. 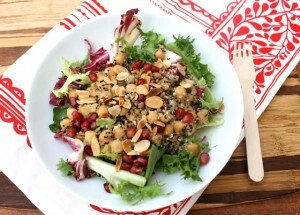 This entry was posted in Recipes, Salads, Vegan, Vegetarian. Vietnamese Nems Salad and Fresh spring rolls: 2 recipes in 1!